A couple years ago, AMD made an interesting move to expand their Radeon line of products to not only contain graphics cards, but memory modules as well. 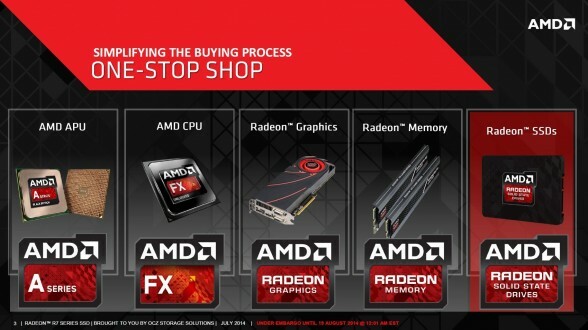 This made a lot of sense for AMD at the time as licensing their brand name brought in additional profit and having branded memory line helps consumers easily pick out the best memory for their AMD systems. Given that AMD doesn’t actually have a memory business, AMD decided to partner with Patriot Memory to produce specially validated AMD Radeon Memory, which would offer AMD system builders guaranteed compatibility with their systems. Of course, there are a number of pieces that go into a great gaming PC, and as such AMD recently decided to hop into the SSD business with the help of SSD giant OCZ Storage Solutions. Considering OCZ makes fantastic high performance SSDs and a high quality NAND supply is no longer in question thanks to the Toshiba acquisition late last year, this is a perfect partner for AMD’s first branded SSD. AMD’s first branded SSD will be called the AMD Radeon R7 SSD, which brings it in line with the new Radeon Rx naming scheme introduced by the Radeon R5, Radeon R7 and Radeon R9 GPUs last year. As far as internal hardware goes, the Radeon R7 SSD will come equipped with a high performance Barefoot 3 M00 controller and the latest Toshiba A19nm (2nd generation) Toggle Mode MLC, delivering read/write performance up to 550 MB/s and 530 MB/s respectively. Remember, despite a naming scheme that suggests otherwise, the Barefoot 3 M00 is actually a higher clocked, higher performance controller compared to the Barefoot 3 M10. Depending on how this goes, personally I wouldn’t be surprised to see a PCIe based R9 SSD and possibly a more mainstream R5 SSD down the line as well. 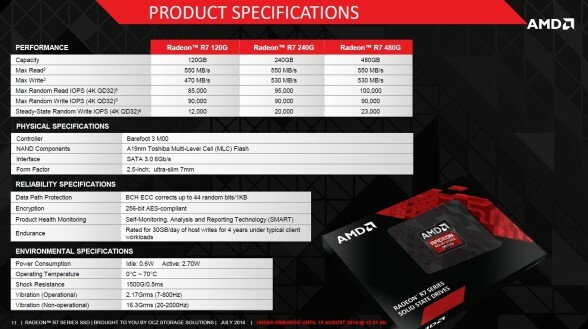 Taking a closer look at the spec sheet, the AMD Radeon R7 SSD will be available in capacities of 120GB, 240GB, and 480GB. In terms of performance, it’s actually almost identical in specs to the Vector 150 with the exception of slightly lower maximum random write performance ratings which is really just a mere 5,000 IOPS lower. 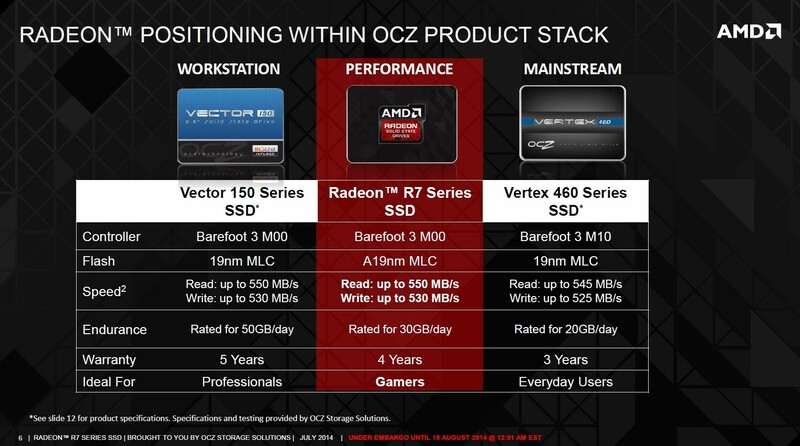 Of course with the OCZ Vector 150 you also get a 5 year, 50GB/day warranty rather than the 4 year, 30GB/day warranty with the AMD Radeon R7 SSD. That said, on paper the AMD Radeon R7 SSD looks like a pretty solid SSD that should be great gamers and enthusiasts alike. Pricing on the Radeon R7 SSD is expected to be $99.99 (~$0.83/GB) for the 120GB model, $163.99 (~$0.68/GB) for the 240GB model, and $289.99 (~$0.60/GB) for the 480GB model. Availability is currently unknown at this time, but it should be available at your favorite retailers in the upcoming weeks.